WHITE STONE—Deacon William O. Carter, 86, of White Stone passed away peacefully on April 10, 2018, at Bon Secours Mary Immaculate Hospital in Newport News after a brief illness. William was born on June 11, 1931, in Downings. He received his education in Richmond County and Lancaster County public schools. William received Jesus Christ as his Lord and Savior at an early age and was baptized at Mulberry Baptist Church in Farnham. After moving to White Stone, William joined Mount Vernon Baptist Church in the early years of his first marriage. In 1979, his first wife, Celia T. Carter, passed away. Four years later, William was blessed with a new bride, the former Carrie C. Taylor. 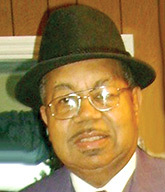 William loved his Mount Vernon Baptist Church home and actively served as an usher, trustee and was ordained as a deacon on September 14, 1986. He was president of the Northern Neck Deacon’s Union and served as chairman of the Mount Vernon Baptist Church Deacon’s Board. He was a past master of the Palestine Masonic Lodge No. 100 in White Stone. William remained a faithful servant of Christ until God called him home. William loved being out on the water and worked for many years as a commercial fisherman for Omega Protein until he retired in 1996. He had a passion for cooking and baking which even carried over into his career in the commercial fishing industry. After his retirement, he enjoyed traveling, cooking, fishing and shucking oysters. William leaves to cherish his precious memory his loving and devoted wife and caretaker, Carrie T. Carter of White Stone; four children, James L. Butler (Vilma) of Fort Washington, Md., Karen Godette (Anthony) of Virginia Beach, Pamela C. Malone (Johnny) of Chesapeake and Karla D. Carter of Chesapeake; eight stepchildren, Gloria J. Morris of Baltimore, Md., Raymond O. Taylor (Peggy) of Fayetteville, N.C., Patricia A. Carsel (Gary) of Staten Island, N.Y., Brenda Bickham (Lonnie) of DeRidder, La., Madaline Veney of White Stone, Eldrema Laws (Hilton) of Kilmarnock, Bruce Taylor (Jeanette) of Montgomery, Ala., and Norma Georgia of Savannah, Ga.; one daughter-in-law, Valeria Carter of White Stone; one sister, Pearline Lewis of New Castle, Del., and one brother, Linwood Carter of Downings. He was a proud and loving grandfather, great-grandfather and great-great grandfather to many beautiful children. He also leaves to cherish his memory a host of nieces, nephews, cousins and friends, including Melvin Norris, who has been a supportive neighbor and friend to the family. William was preceded in death by his parents, Willie Carter and Burdell Jackson; his first wife, Celia T. Carter; two sons, William D. Carter and Cephas B. Carter; one daughter, Doris Yvonne Carter; one stepson, Joseph Taylor; two sisters, Ola Lee and Nettie Criss; and four brothers, Wes Boyd, Kenneth Boyd, Irvin Johnson and Albert Carter. A celebration of his life was held on April 14 at Mount Vernon Baptist Church. He was laid to rest in the Mount Vernon Baptist Church cemetery. William was a kind, loving man who had the ability to connect with so many people from many walks of life. He touched so many lives with his sweet and friendly demeanor. He will be sorely missed.